MAGMA shelving systems designed to store and display foodstuffs and manufactured goods, properly treated and non-perishable. 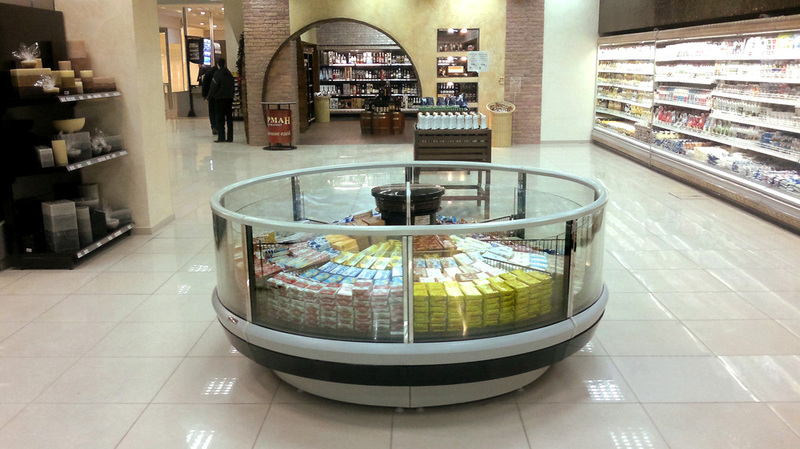 MAGMA shelving systems may be employed in modern self-service stores of large and medium format as well as in the stores with traditional “over counter” format of sales. MAGMA shelving systems are manufactured by high-tech machinery. Improved construction of the shelving system guarantees a significant loading capacity and longstanding exploration. A powder coated painting makes the finishing secure and durable. A constructional solution of MAGMA shelving systems permits to employ different sorts of modifications of the back panels, such as solid, perforated, glazed, laminated etc. Whole lot of hinged elements such as segmented and solid shelves, shelves for books, bakery and fruits; different kinds of boxes and baskets, hooks, price holders, dividers etc, could be used as helpful accessories to the shelving system. Decorative elements are interchangeable. A variety of MAGMA corner units makes it possible to create all kinds of configuration for the shelving rows, fitting in any interior, improving visual proportions of the room. The end units for MAGMA shelving systems create a complete appearance to gondola rows, whereas a variety of versions shapes an individuality of a store. Rectangular and trapezoid units highlight severe and straight lines. On the other hand, oval end units allow to extenuate the right angles. Thanks to variable design elements, MAGMA shelving systems enlarge considerably the functionality of such elements, bearing in mind specific features of different sorts of goods. MAGMA shelving systems make it possible to form the rows of shelves of any length and types, to include wall bay, gondola and gondola with end units. A modern design of MAGMA shelving systems, their variety and multifunctionality allow to correspond ideally either to the concept of design of the interior and to the type of store. MAGMA shelving systems are properly certified and correspond to the European requirements of quality.